American author and former CIA agent Valerie Elise Plame Wilson (Jew) is an author, anti-Neocons (mostly Jewish) and anti-war activist. Last week she was chased by the organized Jewry over her tweet endorsement of Ron Keeva Unz’s (Jew) news website, The UNZ Review publication of her fellow ex-CIA agent Philip Giraldi’s claim that America’s Jews Are Driving America’s Wars. In December 2015, Wilson commented on Philip Giraldi’s article, entitled, The Dancing Israelis: Trump was right about 9/11, but they’re not Muslims, saying she never heard of that. Israel First Alan Dershowitz, one of the warmongering American Jews named in Philip Giraldi’s recent article, called Giraldi an antisemite, and Ms Wilson a self-hating Jew at CNN for agreeing with the claim in the article. Valerie was fired from CIA by Dubya Bush administration as a spy in an attempt to discredit her husband Joseph C. Wilson, former US diplomat who in a 2003 Jew York Times column claimed that story of Saddam Hussein’s buying yellow-cake from Niger was faked as an excuse to invade Iraq which never posed a threat to United States or its regional allies. 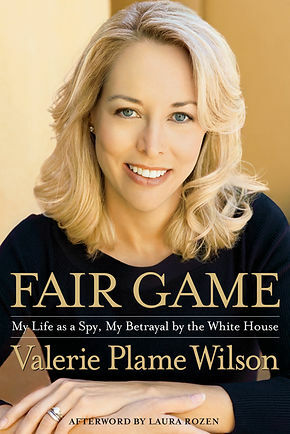 In 2007, Valerie published her memoir, Fair Game: My Life as a Spy, My Betrayal by the White House. The 2010 movie Fair Game was based on Valerie Plame’s memoir. It’s reported that Valerie is trying to raise US$1 billion to buy twitter in order to ban Donald Trump using it to terrorize the world. Valerie is currently a member of board of directors of Ploughshares Fund, an anti-nuclear organization founded in 1981 by American Jewish millionaire Sally Ann Lilienthal (died 2006). Philip Giraldi below explains that Israel has never been United States’ ally. BTW – I’m no fan of The UNZ Review or its sister publication The American Conservative, as I was banned there for challenging Western lies about Muslims and Islam.